A Writing Toolbar is available to you when writing in the visual editor. This toolbar provides most of the common formatting features to make formatting and styling your post easier. 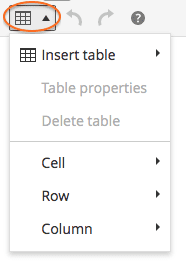 By default, you will only see one row of icons. To view more features, click the icon called the Kitchen Sink (the icon circled below) to expand the second row of options. If you hover over each tool, you will see a description of its function.